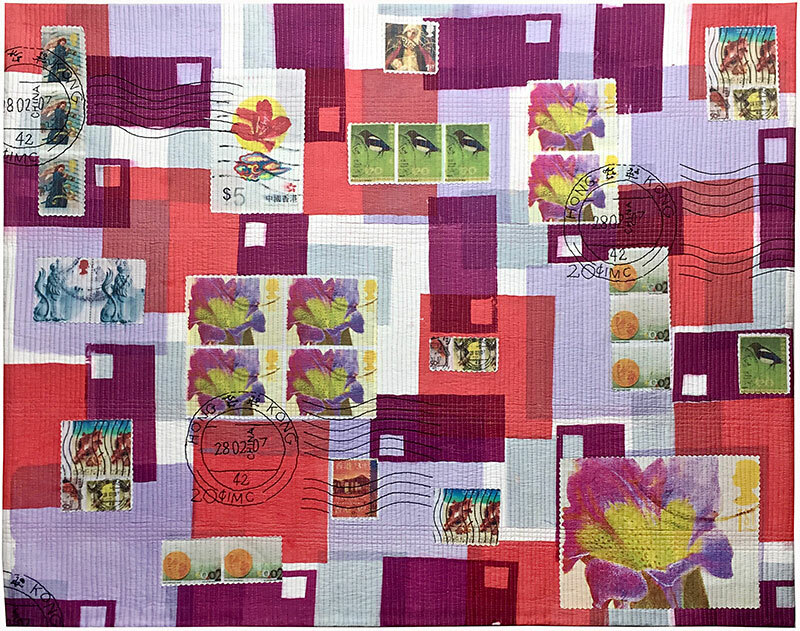 ​ This is the second exhibition review I have been invited to write about the Zero3 group of textile artists, since my initial review of their first Signature exhibition in 2006. Over the intervening years, the line-up of artists contributing their work to the Zero3 exhibitions has gradually evolved, although I’m pleased to note that three of the original artists are still members of the group. The new members joining the group over the years have enabled the whole group to maintain its momentum and encouraged each artist to move forward with their work. 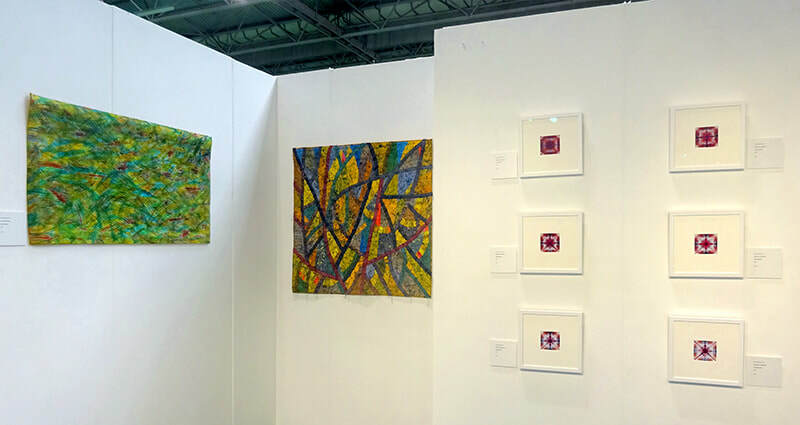 This was clearly evident in their latest exhibition, Signature VIII, at this year’s Festival of Quilts, held in August at the NEC in Birmingham. The work on display included a wider variety of styles and techniques than in their previous exhibition at Festival in 2012, which, in addition to enhancing their beautifully hung display, caused me to make notes on the techniques I haven’t explored yet, so that I can try them out at the first opportunity. 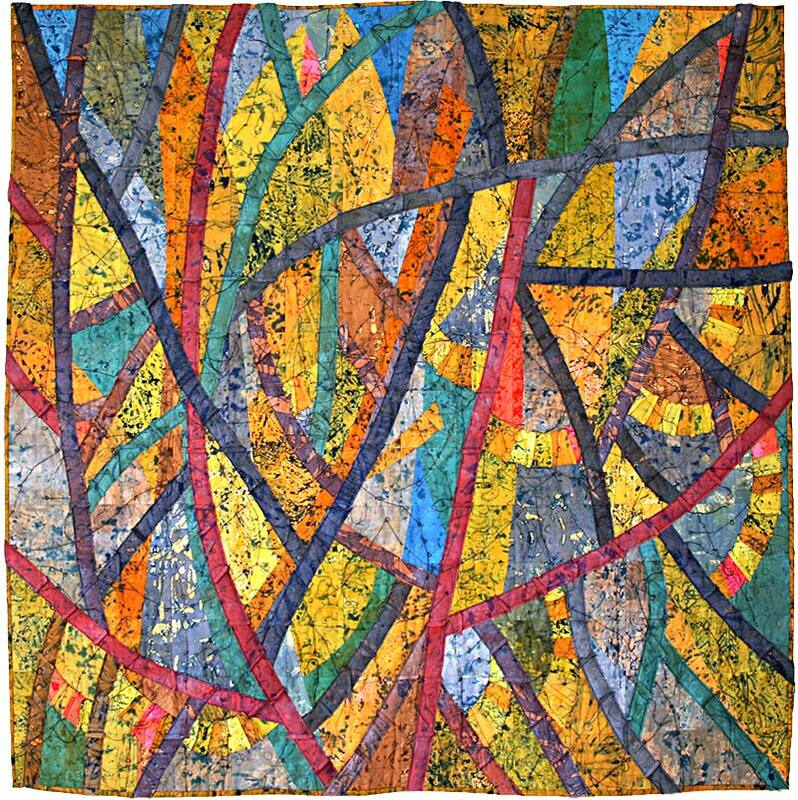 Founder member, Audrey Critchley, showed two quilts that were quite different in style to her work in recent years, but also very different to each other in their construction and colour combinations. ‘Letters from Abroad’ showcased photo-printed enlargements of beautiful, colourful foreign stamps. The strong pinks and lilacs of their flowers were repeated as blocks of colour on the white background, which made for a lively quilt. The addition of enlarged and stitched franking machine marks linked the subject and its title perfectly. By contrast, ‘Circles in the Air’ had a very subdued palette, with bands of hand-printed fabric in soft, earthy pastels alternating with strips printed with black on white. The whole was embellished with three large hand-stitched and tufted circles, again in soft colours, which had been perfectly positioned to enhance the overall piece. Another member showing completely different styles of work was Janine Ayres. ‘The Eternal Fabric of Knole’ was formed of two layers of silk organza, , which hung free in front of a long length of white Lutrador. Both layers of white organza were covered with negative stencils of handprints set against a grey-black background, with a different arrangement of hands on each layer. The white cotton background had been printed with people’s names, whom I presumed to be some of the people who had lived and worked at Knole in times past. Janine’s second piece, ‘Colour 13’, couldn’t have been more different! The black background fabric was discharged and then dyed in rich colours changing from magenta, blues, greens and yellows and back through to magenta. Torn paper appeared to have been positioned over the black fabric to act as a resist whilst the exposed areas were discharged. Where the rainbow colours remained, they had been stitched with horizontal lines in a variegated thread across two of the strips and with vertical lines on the third and outer strip. It was a simple, but very beautiful piece and was definitely the piece I would have liked to run away with! ‘Railway’ by Cindy Kearney, another founder member of the group, depicted a railway bridge over a body of water. I was unsure whether we were viewing the railway line from above or from the side (from above, I think), but the combination of the black railway against a watery background was very atmospheric. The piece was very heavily machine-quilted, with the varied blues of the water also including pink highlights, which really brought the water to life. Janet Twinn is a long-standing member of the group, the intricacy of whose work I have admired for many years. The two pieces exhibited here had pieced backgrounds, embellished with short pieces of her hand-painted and dyed fabrics, joined together with exposed seam allowances and laid in curved strips around additional areas of crazy patchwork. Big stitch quilting and trailing threads added to the texture of the pieces. ‘Meadowsweet’ was in vibrant greens and yellows with flashes of bright turquoise-blues and pink-oranges, whilst, ‘Shadows on the Stones’ was in the softer colours of lemon, ochre, peach, brown, a grey-blue and purple, with occasional small accents of bright orange, red and pink. 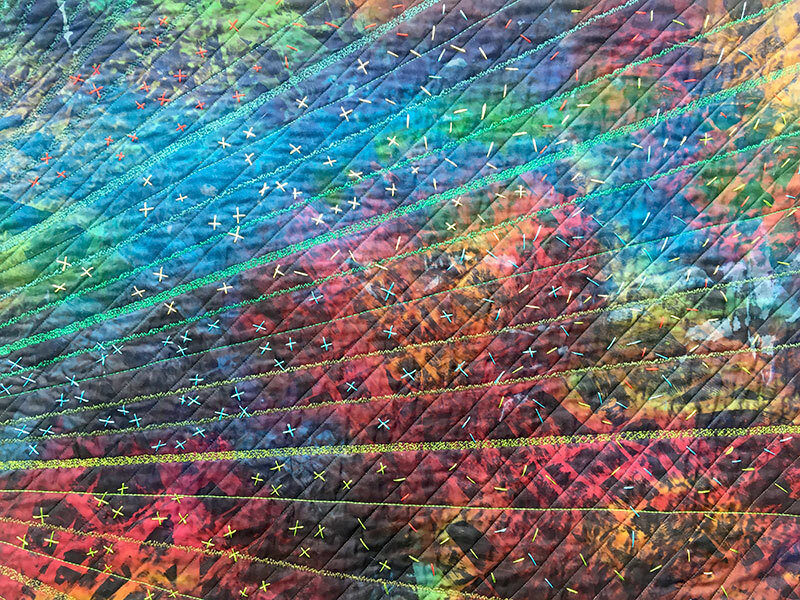 Maggie Barber’s two pieces both showcased her skill at very intricate and precise free-motion machine quilting. ‘Celebrating Burma’ was in the form of a mandala. The delicate and very detailed design had been intricately stitched on a cream background, with the background itself even more densely stitched. Maggie’s second piece was a balanced and very pleasing design of appliquéd circles, crescent shapes and squares in mustard, brown and tan on a cream background. The background was again free-motion quilted with a mind-bogglingly intricate pattern that again left me gasping at the sheer concentration needed to achieve such detailed work. Janet Atherton, the third founder member, works with a much looser style, both in her fabric printing and machine quilting. 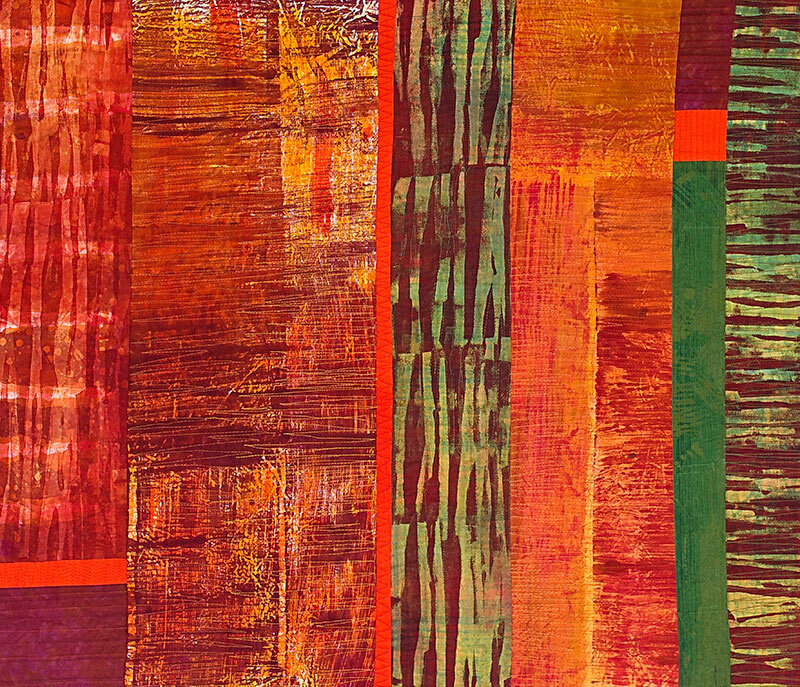 ‘Tuscan Landscape II’ had large sections of vibrant tans and burnt sienna, interspersed with strips of sage green and brown printed fabrics and narrow strips of bright orange. I loved the hot colours. By contrast, ‘Lakeland Walking’ had swishes of yellow-greens, emerald and turquoise, with flashes of a rusty-red peeping through. The quilting had been divided into large curved areas of parallel lines, echoing the curves of the painted fabric. Still on a countryside theme, Roberta Le Poidevin showed a wonderfully calming piece entitled, ‘Meadow GY7’. The effect of many blades of grass drawn against a blue background was enhanced by hundreds of French knots worked in cerise, yellow and white to represent the wild flowers in the meadow. It was lovely. Jennifer Millard’s ‘Daisies 2’ was another beautiful piece evoking the flowers and grasses of a meadow. This time, we were at ground level, in amongst the grasses, white daisies and hints of pale pink flowers. The dye-painted scene had been enhanced with a few simple, arched quilting lines representing grasses, whilst a sprinkling of French knots decorated the daisies’ yellow seed heads. As someone who loves the dye-resist techniques, I probably spent longer in front of Jennifer’s second piece, ‘Ash’ than any other piece in the gallery. The wax-resist printed ash leaves in a blue background fascinated me, as the leaf imprints varied from light touches through to solid leaf shapes, giving the impression of leaves fluttering in the breeze. The centre of each group of fronds had tufts of beaded threads protruding from the surface, adding to the three dimensional effect. The work was finished with a simple frayed edge and mounted in an unfussy way against a slightly larger blue background. Wax pot here I come! Jude Kingshott specialises in Shibori-style techniques, including folding, clamping or tying fabrics she has previously hand-dyed in bright colours, creating wonderfully colourful cloth, which she embellishes with hand stitching. The twelve pieces included in the exhibition under the title ‘Separate or Together’, were in a range of magentas and dark blues, some retaining areas of white, which gave them a very delicate appearance. Each design had been embellished with simple, but very effective, hand stitching. The pieces had been individually mounted in white frames, making them appear even more delicate. 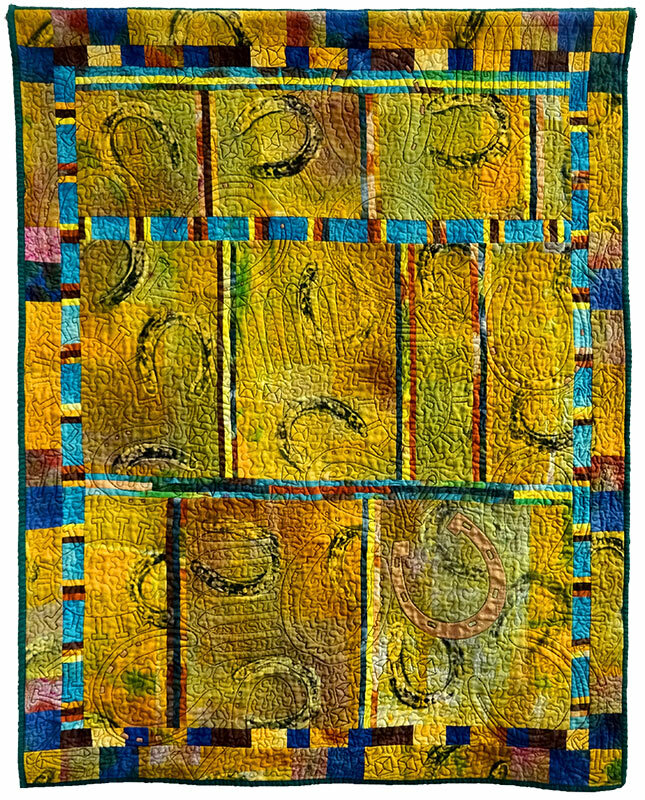 ‘My Lucky Day’, by Rosemary Hufton, was a really interesting quilt. The overall colours were earthy ochres and greens, divided into smaller shapes by tiny pieced strips of yellow, orange and brown set between longer lengths of bright turquoise. The main fabric had been printed with horseshoe shapes, which were echoed in the quilting, together with horseshoe nails and some comb-like shapes that are presumably relevant to the horseshoe theme. This was a well hung gallery, with a variety of work which showcased the groups’ differing styles in a very harmonious way. It is always a pleasure to view their work and I look forward to seeing how they develop in the future, both as individual artists and as a group.